Join us for a drink to launch the innovative, interactive e-Book and to see what happened when nine experimental artists and architects were parachuted into best-practice local initiatives in 7 different cities: London, Paris, Turin, Berlin, Johannesburg, Cape Town, and Durban. Participating artists Doung Jahangeer, Terry Kurgan, Taswald Pillay and Chati Munyaradzi will be sharing their experience and presenting their work at the e-book launch. Nine Urban Biotopes is a residency program, funded by the EU, directed by Stefan Horn of Berlin based urban dialogues, and partnered and organised by the Goethe-Institut in South Africa. It ran throughout 2014 and aimed to generate a conversation about the future of urban living in cities in Europe and South Africa. By combining, linking and implementing 9 Urban Biotopes within a South African–European partner structure, local answers to global questions were discussed in such a way that they shed light on sustainable solutions and innovative ideas regarding urban development issues. The project took place in three phases, so-called trialogues. In the first trialogue, artist/architect Marjetica Potrč and her Hamburg based students of Design for the Living World, transformed public spaces in Soweto into community hubs. 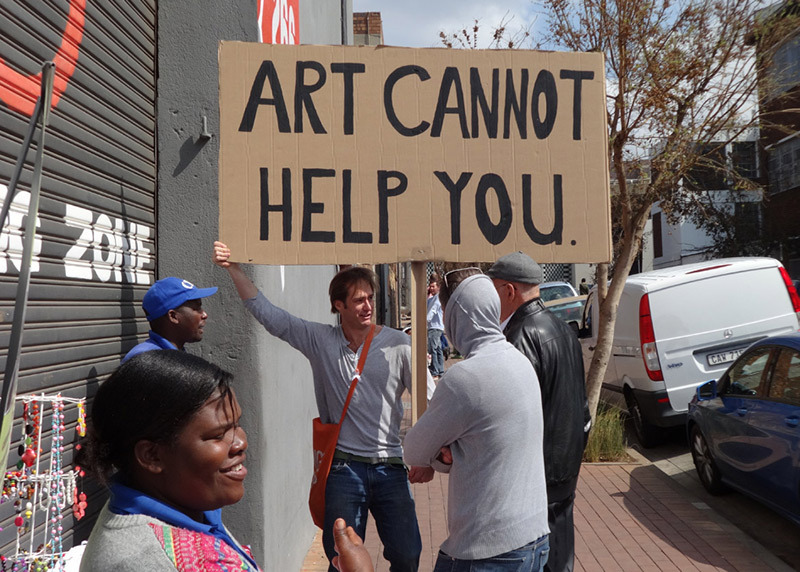 At the same time artist Athi-Patra Ruga worked with members of the Youth Theatre Office in Berlin on a performance around the question of identity and artist Antje Schiffers educated herself on how everyday life in Cape Town is made manageable. In the second trialogue, architect Taswald Pillay engaged with a Roma community on the outskirts of Paris while at the same time photographer and media artist Armin Linke commuted with the street traders from the Cato Manor township to Durban’s market district, and visual artist Dan Halter gardened in an allotment in Turin next to the Fiat factory plants. In the third trialogue, Terry Kurgan explored the phenomenon of co-housing cultures in Berlin, and meanwhile Anthony Schrag collaborated with local neighborhoods in three inner-city districts of Johannesburg, and Ra Hlasane shared radical forms of pedagogy and self-devised curricula with a group of young people in South London. Distribution of the eBook will be through Apple and Google stores, and available by March 31st. More information about the 9 Urban Biotopes project and video statements by participating artists here.